What is also judged is clear articulation of the business challenges the technology is addressing, early proof of concept of the products, and revenue model and scalability. 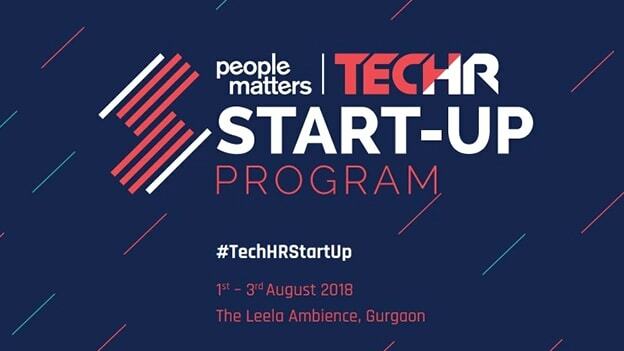 Over the years, the program has brought to fore many early-stage startups in the HR technology space that have gone to raise funding and get the desired attention from investors and recruiters alike. This year’s lineup as well has many innovative HR tech startups eager to disrupt the rapidly changing space. Here’s a sneak peek into some of the newest participants of the TechHR Startup program this year. USP: To connect the best companies and top talent more efficiently and faster than ever with an easy, simple and hassle-free experience. When booking a cab or ordering food has become a matter of a simple click, why should not applying to a job be as simple? 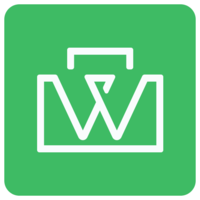 Workruit is a new-age, mobile application that makes recruitment simpler, efficient and hassle-free – both for companies as well as applicants. The mobile platform founded by Manikanth Challa makes aims to provide a simple, instant, more effective and de-cluttered way of applying to jobs. The startup aims to eliminate the need to sort through databases and uses technology to simplify the recruitment process so that only the most relevant, useful information (profiles and jobs) are shared. 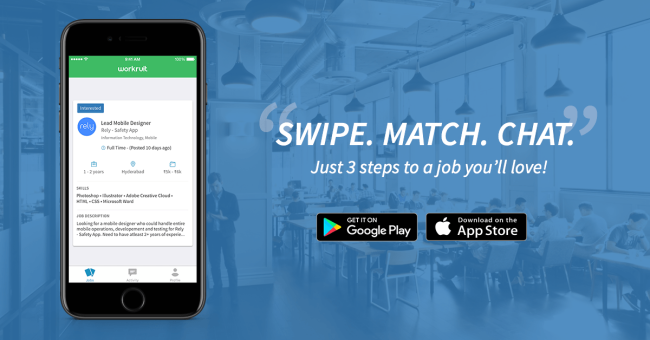 The in-app messenger platform makes recruitment as well as finding jobs, much easier and on the go, ensuring that candidates can quickly apply to any job that they like by simply swiping right on the mobile app. Thus through banking on high relevance, the startup aims to eliminate the irrelevant information and create a bridge between expectations and reality for the target audience. How do you disrupt the rewards space and provide an end to end solution for all reward needs of an organization? This is what Compport (Innovativeapp.com) is aiming at. The startup aims to provide a single solution covering all aspects of the rewards program and can also work as a basic HRIS system with the idea of enabling a transparent culture in the organization. Compport offers transparency and simplicity by sharing the right amount of compensation information and even allows employees to view and structure their total earnings. Through its instant survey feature, it enables them to give feedback on compensation matters and even have an option to recognize a peer member across the organization. 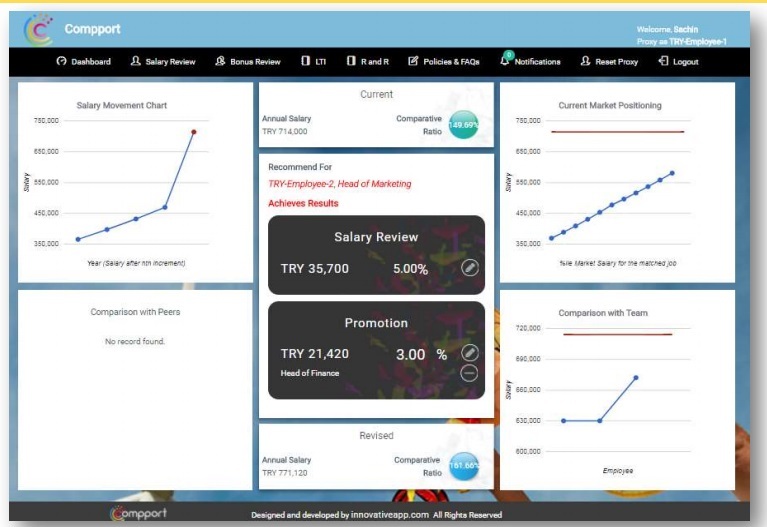 Meanwhile, managers can view their team’s compensation details, recommend salary increase, promotion, bonus/incentives for their team members, and manage salary budgets within defined flexibility. HR can run Compport as their HR Information system with analytical & reporting capabilities and design and roll out salary review, bonus/incentive, R&R plans or FlexiPay structures. USP: An opportunity to enhance employee’s financial well-being, access to fair products as well as enhancing their productivity. Moving just beyond the HR services, how can organizations enhance the financial well-being of their employees? Nowadays 1 in 4 employees report that financial stress has affected their ability to do their job, employers cannot afford to neglect the effects of financial stress on their employees in the workplace. SalaryFits has the answer to that. The platform allows financial institutions to integrate their systems with payroll information of entities, providing access to a new risk assessment tool. It also provides the possibility of deducting installments directly from one’s salary. Based on the idea of making sustainable credit a reality, the platform incentivizes employees to build in good financial habits, enhance their financial health, and helps them feel stable and supported. On the other hand, it provides an easy and convenient commercial channel for the providers to reach a large number of potential clients, without the need of an expensive sales effort. The platform is cloud-based and currently integrated with more than 100 payroll systems. This model is particularly interesting for individuals who have difficult access to credit lines, or those who already have the relevant burden, and need to find an alternative credit to consolidate their debts at a lower cost. For the employers, the technology is a unique opportunity to enhance employee’s financial well-being, access to fair products as well as enhancing their productivity. Employees can have access to cost-effective financial products with lower interest rates and less bureaucracy, as well as a better management of their financial health. What if a technology could automate the entire cycle from the beginning to the end such that recruitment can be delivered as a service like SaaS? 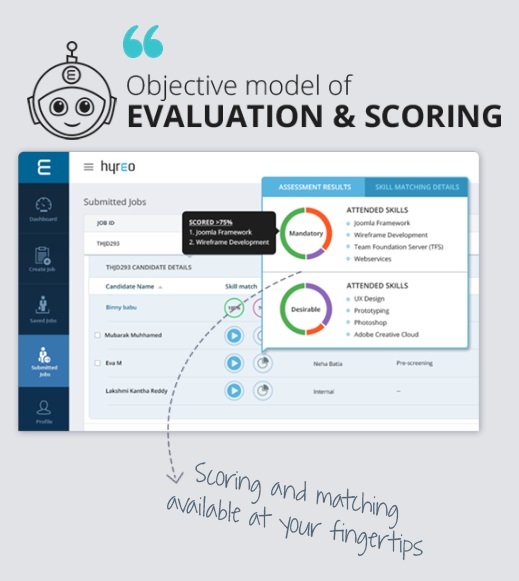 This is what Hyreo, a SaaS solution that helps automate the entire recruitment process from creating job requirements and sourcing CVs to screening candidates, managing vendors and closing the recruitment cycle aims to do. The NLP and chatbot enabled recruitment platform helps hiring teams ‘Discover, Engage & Manage’ talent more effectively. The startup offers employs an intelligent chatbot agent, resume matching algorithms and data aggregation techniques for discovering and engaging with candidates. It even takes care of scheduling, rescheduling, and doing follow-ups, freeing up recruiter time for the most critical interactions. Hyreo has also raised less than $250,000 in funding. It also won a government grant of $17.816 (Rs 12 Lakhs) from Kerala Startup Mission in December 2017. While there is a lot of talk of the all-pervasive AI, one startup is aiming to make these technologies available extensively for HR. PredInt is a Data Science company that offers Artificial Intelligence-based products that include prediction algorithms, optimization algorithms, and data visualization tools for Human resources. Its mission is to make these AI-based solutions accessible. It helps companies in effectively addressing the employee attrition problem by accurately predicting the attrition and its drivers at talent acquisition and at employment stage. The startup has developed sophisticated machine learning algorithms to make predictions related to every aspect of the Human Resource function, from recruiting to employee engagement and retention. It aims to help a business maximize its potential, bring AI to HR to deliver people analytics far and wide within the organization, and take an action to prevent a high performing employee from possibly leaving the company. ZoomLearn is a talent technology company that believes in the power of technology to transform HR. It combines technology to talent management with a focus on creating a sustainable competitive advantage. The startup aims to leverage technology in sharpening Talent Development, enhancing Employee Engagement and optimizing HR operations. It offers a comprehensive e-learning platform supporting all modes of learning, and enables organizations to create a captive user base, with a marketplace to monetize it. So on one end, it aggregates users through freemium and on the other hand, it aggregates content providers through the marketplace. With its products, it helps its clients in identifying and deploying the right technology in Talent Management. It is also the e-learning partner to Indian Society for Training & Development (ISTD) to deliver their internal online learning initiatives to their members across the country. USP: India’s first on-demand interviewer platform, it works on the unique concept of an outsourced interviewing model which helps the organization save 50% of time and cost spent on hiring. InterviewDesk is built as a marketplace model, with a vision of building India’s largest interviewing community. The on-demand interviewer platform offers a curated interview process and best in class interviewers to assure companies that their talent pipeline is assured. With lots of advancements happening across all the industries, there is a considerable increase and demand for unique talents. InterviewDesk is bridging the gap of Interviewer Bandwidth by doing one level of screening on behalf of the organization with its troop of experts who are not only passionate about interviewing but also help organizations identify the perfect talent easily and rapidly. With its curated interview process, the startup aims to be more than just a one-stop shop for offering hiring solutions. Be it a jobseeker, employer or an interviewer, InterviewDesk promises to revamp recruiting in ways that are tailor-made. In addition as a marketplace, it aims at creating a user-friendly and flexible platform for interviewers who are passionate about the work they do. NEXT STORY: What do you do with 99% campus graduates who you don’t hire?